You are here: Jake's Bones > Braco 200: My village - then and now ! I know this path well because it leads to the pheasant woods which is where I started bone collecting, and I've walked by it so many times. 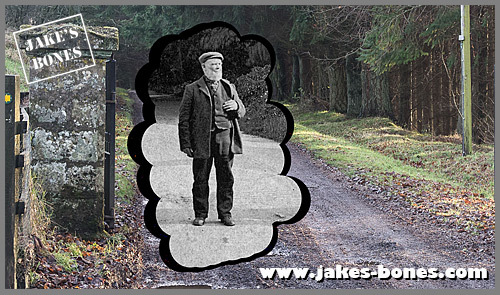 But until recently I didn't realise that but over 100 years ago, this man stood right here in this exact spot for a photograph, outside his long demolished house. How do I know this ? Because while I have been researching blog posts about my village for its 200th anniversary I have found loads of old photographs of my village (I'm pretty sure they're all out of copyright, which is why I've used them below). This is the main road that runs through the middle of Braco, and the view from the south as you come into the centre. When this was taken, there were no houses on the right hand side, but there are now. Most of the village is on the left hand side of the picture.On the far horizon in the most recent picture you can see the Suicides Graves and Titus Well woods where the herds of red deer live, and where I have found some of my best bones. If you look at the two different photos, you can still see the similarities in the buildings. The best being the windows and the spaces in between them. The chimneys change is you look at the pictures closely. This photo is from the midde of Front Street looking back south and was taken around 1948. The buildings look mostly the same ( the hotel in the old photo is currently derelict but is going to be a pub again). If you look on the old hotel, you can see that there was a extra part on top of the roof which is not there now. The houses on the left were just being built when this photo was taken. The grocers and ironmongers James Forbes and Co was set up in the 1880s. This picture is from around 1889. In 1948 the store was sold to the Dunblane Co-operative Society. After that it was sold to a furniture business called Etcetera, then became a store for Kenneth Anderson Designs. There's a rumour it's about to be turned into a cafe. This is at the far end of Front Street looking south. The white house that you see in the old photo is still there today, just the plants and signs are blocking it. This building was an inn in the old photo, but it is now a house. You can tell that this photo was taken before 1948 because the houses on the right were not there yet. If you took the road on the right hand side of the picture before right, you would end up walking along here. This was taken around 1910. The Free Church in the background was demolished in 1929, leaving just the tower. On the left is the primary school, on the right is the village hall (built in 1926, so not in the old photo). That also means the far tree outside the hall is about 110 years old ! Here is the far tree in the foreground again. This picture is the local primary school, the one that I went to. The picture was taken in 1904, when the headmaster would have lived in the school. The tree in the picture is still there now ! This is the Braco hall, where all of the social events happen in Braco.The hall was built in December 1926 and cost £3,000 which was paid for by James Findlay Drummond of Braco Castle. This is looking west on Feddal Road, with the school playground on the left, and the junctions with Church Street on the left and the road to Braco Castle on the right. This is at the south end of Church Street, looking north towards the junction with Feddal Road. I think that this was one of the first streets in Braco. In the old pictures you can not see any pavements, so I think that it was taken before there were many cars around. In the background, you can see the Free church. This is looking along Church Street from the other end. The wall on the left is the entrance to the school. You can see that the gate that leads to the school playground. The Free church is just to the right of this photo. I have written LOADS about Ardoch House before. The old Ardoch Estate dated back hundreds of years, and this south lodge is one of the few remaining buildings. This was one of the roads to the main house, which went over a bridge (which was swept away in a story about 80 years ago). This is the main house - photographed around 1910, then in 1985 when it was derelict, then the same site in 2012. I blogged here about how I discovered the exact site where it was - and how it managed to vanish without trace ! Finally, this is the photograph I began with. This is the North Lodge which is the main entrance to Ardoch House in the early 1900s. Possibly Mr and Miss Scobie, his daughter in the photo. This is the entrance I use when I want to go into the wood. The lodge is now completely demolished and no trace remains. It is haunting to see the streets that I walk along today as they were before my Grandad was born (happy birthday today grandad !) , and I wonder what they're going to be like in another hundred years.